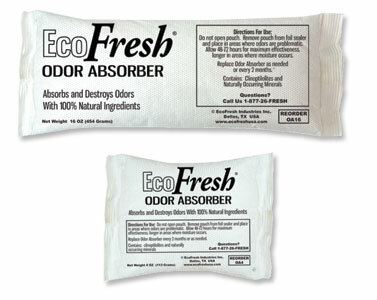 How long is the EcoFresh odor absorber effective? Until the pouch is fully absorbed. The pouch contains a product known as Zeolite, which acts as a sponge to absorb organic vapors. When it is full, it is no longer effective. So there is no exact answer to your question, as it depends on the severity of the odor. I have seen them last up to 90 days in some cases.